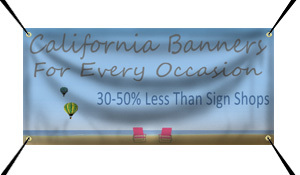 Vinyl Banners from Banners.com are 30-50% Less Expensive than your Local Milpitas, CA Sign Shop! Why Buy Vinyl Banners from Banners.com in Milpitas, California? Banners.com prints and ships vinyl banners to locations all over the United States. One of the locations we ship banners to is Milpitas, California. Whether you are looking for a banner for your school, church, company, sports team or for your event, Banners.com has you covered!